Moving into a prime space perched atop La Jolla Cove is a new seaside cafe from Carmel Valley Coffee Roasting Company, a more than 20-year-old roastery from the Monterey area of California's central coast. 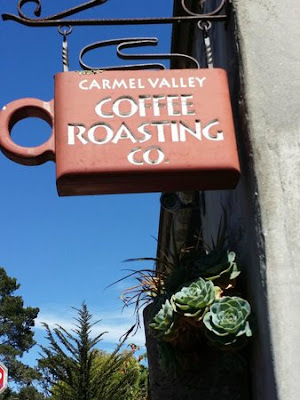 Purchased seventeen years ago by Dean & Janet McAthie, Carmel Valley Coffee Roasting Co. is a 24-year-old company that has six stores as well as a bustling roasting facility and wholesale business based out of the Monterey Peninsula of California. The launch of the new La Jolla location coincides with a brand update for the company, which includes the launching of a new logo with a design meant to celebrate the charm of Carmel-by-the-Sea in northern California. The La Jolla shop will showcase the timeless, elegant lifestyle photography of Slim Aarons, which will be printed on sustainable aluminum in large format around the store. Like other outposts, the La Jolla branch will also offer classic 70s vinyl music being played, with customers able to change up the tunes and play records from an ample collection. "We wanted to bring our coastal brand to another timeless location like La Jolla," explained Carmel Valley Coffee Roasting owner Janet McAthie. "As a family, we love visiting San Diego every year and we were inspired to spread our wings because we felt very comfortable here. La Jolla is an equally timeless location, with a welcoming and friendly community and excellent domestic and international tourism. We tried to honor the quaint design of the store's existing footprint and added some 100-year-old reclaimed wood from Northern California to the counter fronts. The vibe is coastal chic - a place everyone can feel comfortable coming in for a quick stop or to linger for a while and take a break in their day." The La Jolla location will also offer two lovely patios - a front patio will be parallel to Prospect Street with bistro seating and umbrellas, with another side patio sited under a pergola above the landmark Crab Catcher Restaurant with views of La Jolla Cove. Carmel Valley Coffee Roasting Co. will offer a traditional coffeehouse experience, offering a menu of fresh, organic coffee and espresso drinks. Each month the cafe will feature one signature organic coffee bean producer from around the world. Specialty items include the signature blend Organic Carmel Foglifter, Organic Cold Brew, and Bourbon Barrel Aged Coffee. The cafe will also serve Organic Rishi Tea, both hot and cold. In addition to coffee products, Carmel Valley Coffee Roasting Co. will offer a limited food menu with morning pastries, afternoon cookies, Sweet Earth vegan breakfast burritos and panini pressed breakfast sandwiches. Expect the cafe to open as early as the first week in May. Carmel Valley Coffee Roasting Co. will sit at 1298 Prospect Street, Suite 1A, in San Diego's La Jolla. For more information, visit carmelcoffeeroasters.com.